PALM SPRINGS, Calif. -- Two officers died and one was injured after a suspect opened fire during a family disturbance call in Palm Springs Saturday afternoon. Authorities said the shooting happened near East Del Lago Road and North Cypress Road. A female called around 12:18 p.m. saying her adult son was causing a disturbance in the 2700 block of Cypress Road, according to police. Two officers arrived on scene and the man would not open the door to the home, threatening to shoot them. Within 10 minutes of the officers arriving, an emergency assistance was broadcasted, according to Police Chief Bryan Reyes. During an afternoon press conference, Reyes said the house was surrounded and they believe the suspect may still be in the residence. The investigation has been turned over to the Riverside County Sheriff's Department. 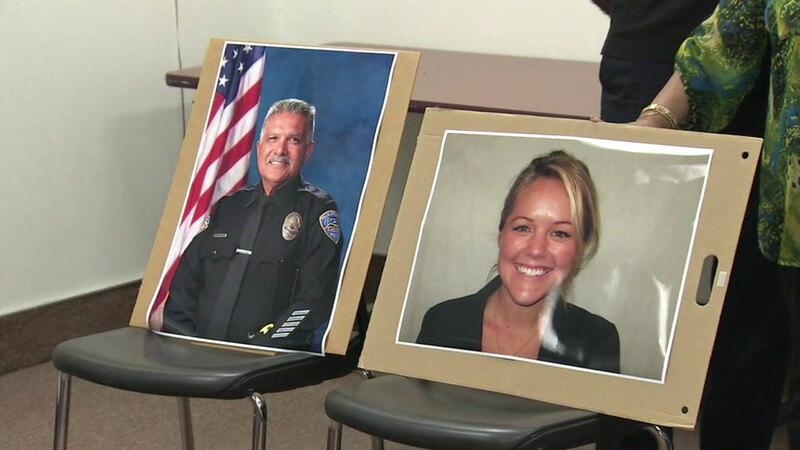 Reyes named the two officers who were killed: Officer Jose Gilbert Vega and Officer Lesley Zerebny. Zerebny, 27, had only been with the department for a little more than a year. Reyes said she had given birth to a child about four months ago and had just returned to work. She was married to a Riverside County sheriff's deputy. "I am awake in a nightmare right now, that's me. As the chief of police for this police department, I've got to step forward and stay focused," Reyes said as he held back tears during the press conference. He said the Palm Springs Police Department and other agencies continued to pursue leads on the suspect in case he may not be in the home. Later in the evening, authorities used robots to breach the front door of the suspect's home. A Riverside County sheriff's official said no details on the suspect would be released until changes developed in the search or barricade situation.